Magazines are great fun aren't they? You know the feeling when you have a comfy chair and a magazine and nothing else to do? You get a little aflutter. They are the best thing about plane trips, the only redeeming factor in waiting rooms, and still the best way to scope out your fantasy wedding dress. But you know what is better than all that? Reading one with your mom. It is sort of an unofficial tradition that we read the holiday issues of Real Simple together each year. Often under a snugly blanket with tea or wine. And so it was this year. We bought the November issue last weekend (I was home visiting for my Dad's birthday) and carefully selected the sections to read first. We were excited to get to the "Real Steals" section where they promised to offer cute winter staples under $100. Right up my alley, yes? No! I will grant them that each piece was under a hundred, but I was appalled at the $57 tights that were supposed to be a steal! Mama and I were shocked at their selections. Especially with the $99 cocktail rings often tacked on the outfit. Staples? Really? Mama taught me to be thrifty and so in honor of her and to spite Real Simple, I am offering a more affordable option to their "affordable" fashion. Here we go, lets get smarty pants! I love the textural knit sweater as the show piece for this outfit. 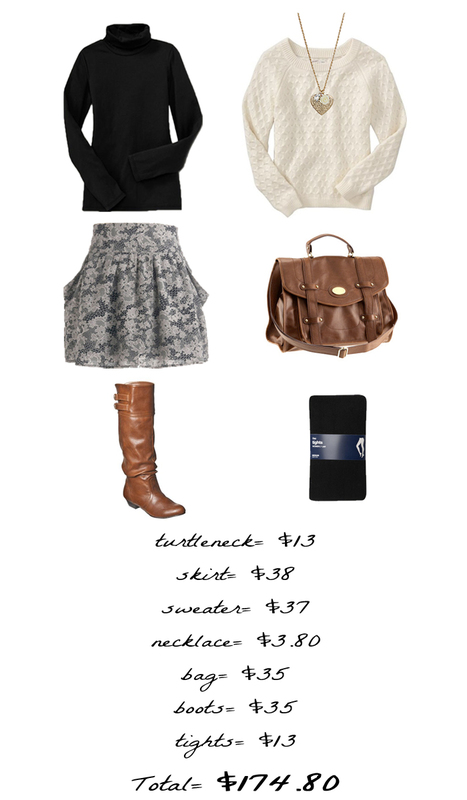 It is girly and cozy, two of my favorite styles. I really do enjoy this ensemble. However, I have a few issues with it. Price, obviously. For $311 you still don't get any shoes or accessories! But I also know I couldn't pull off that tiny body-con skirt in the middle of winter so I offer another option; a lovely lace number that is a little fuller but still has the same coloring and scale of pattern. What do you think?